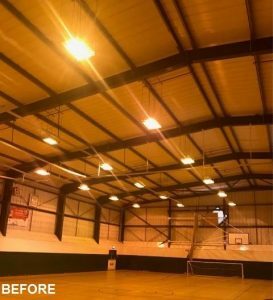 Fitzgerald Lighting has recently been involved in the installation of a new LED lighting scheme at the sports hall of Nescot College in Epsom, Surrey. North East Surrey College of Technology (Nescot) has become one of further education’s success stories. Attracting learners from the local community, nationally and from overseas, Nescot’s range of courses include further education, higher education, professional, leisure, short, full and part-time courses. Fitzgerald Lighting’s Hi Sport LED luminaire was recommended by Surrey based wholesalers Spring Electrical and installed by local company Get Connected Electrical Contractors Ltd. Get Connected was appointed by Nescot to upgrade its sports facility’s outdated lighting to deliver an improved light quality and reduce its expenditure through lower energy bills and maintenance. 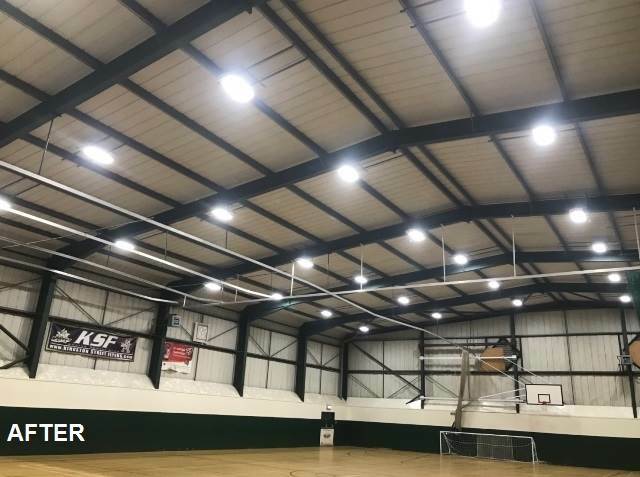 28 of Fitzgerald Lighting’s 105W Hi Sport LED luminaire were chosen for the project as they could be easily installed into the pitch of the ceiling without the need for trunking and met the required lux levels for an indoor sports hall. The LED Hi Sport is a purpose-built, durable luminaire designed for indoor sports environments. Manufactured from mild steel and powder coated white, it has a stylish curved body shape which minimises the chance of sports balls and equipment getting trapped. A diffuser shields the LEDs to reduce glare distraction during high performance sports events and the luminaire also features a wire guard as standard. Designed for surface or suspension mounting, the Hi Sport luminaire features swivel adjustment and has a shock resistant gear tray. Optional features can be specified including 1–10V dimming, DALI dimming and integral three-hour maintained emergency lighting. The LED Hi Sport from Fitzgerald Lighting is ideal for all indoor sports applications, including sports halls, leisure centres, squash courts and indoor training areas. Made to IP20 and carrying a five-year warranty, the LED Hi Sport comes in a 96W, 9944 lumen version, a 126W, 13192 lumen version, and a 186W, 19475 lumen version. All luminaires are quite compact, being just 145mm deep, 340mm wide and 835mm long. Other wattage options are also available.